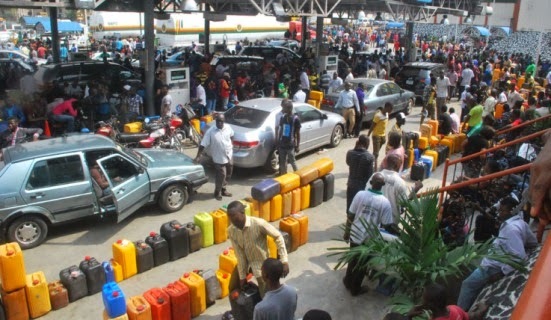 Organised labour on Friday, December 29, threatened to embark on strike if the ongoing fuel shortage ravaging the nation extends to next year. A press statement issued on Friday said it also hailed the President of the Senate, Bukola Saraki, for directing the Senate Committee on Petroleum Resources (Downstream) to cut short its recess and immediately convene industry stakeholders meeting in a bid to end the ongoing fuel crisis. According to the labour leader, the bane of downstream sector was “abysmal absence of accountability, transparency and openness in the administration of the petroleum resources of Nigeria.” He said only the parliament can make a difference in “exposing the rot” in the sector. Aremu said the senate leadership by urging relevant committee members to resume duty has shown that the legislature is truly “a vent for public grievances, a “useful organ of public opinion” adding that legislators cannot be in recess when those who elected them are groaning in filling stations. The labour leader urged the legislators to demand for “consequences for the actions and inactions of petroleum sector operators in the product shortage scam. “There is a deep-seated conflict of interest in the downstream sector; regulators are operators, regulators are importers, importers are products hoarders, regulators are also saboteurs, definitely we have a sector capture in our hands, Nigeria and Nigerians need liberation,” he remarked. Aremu however said if the intervention of the legislature fails to put an end to product shortages, labour may compel all Nigerians to return to street protests like in the past “to force the ruling elite to face up to the challenges of governance of the most populous promising but badly governed country in the continent. The one-month long fuel shortage has further worsened poverty, put productivity on hold. We dare not enter 2018, new year with this recurring old mess,'' he said. This kind gesture from the party was made public on Thursday, December 28, by the party's national publicity secretary, Bolaji Abdullahi.